Depart Singapore Changi Airport for your flight to Sydney. Upon arrival, collect your car and begin to explore the city of Canberra. Highlights include Australian War Memorial, High Court of Australia, Parliament House and Mt Ainslie Lookout. 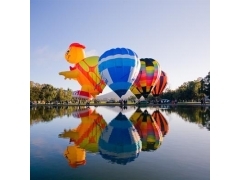 You may take a hot air balloon ride that will drift gently over the city of Canberra. Be mesmerised by the magnifi cent Parliament House and the elegantly laid out suburbs, giving you a whole new perspective of the peace and tranquility in Canberra. Experience the best of the region with the Poacher’s Way which brings together the region’s award winning wines and fresh local produce. Drop by Poachers Pantry, a traditional country smokehouse to enjoy a gourmet lunch at Flint in the Vines, or tempt your taste buds at Robyn Rowe Chocolates, a top drop at Clonakilla winery or Helm Wines. Do not miss a dazzling display of gardens and miniature buildings from around the world at Cockington Green Gardens. End your day by savouring the region’s best cuisines at one of the many stylish Canberra restaurants. Travel to the historic Bungendore, home of the Wood Works Gallery. Satiate your taste buds at Lark Hill Winery or Les Tres Bon for unique French dining. Continue towards the historic Braidwood and sample fresh cheeses at the Old Cheese Factory. Drop in at Sully’s Cider for traditional handcrafted cider. Not to be missed is a side trip to Mogo Village Honey, Mogo Fudge or Tyler’s Pantry. Next, proceed to Mogo Zoo to view exotic species including its famous pride of white lions before continuing to Batemans Bay Nut Roasting Company where you can sample a variety of roasted nuts. This morning, travel to Jervis Bay and join Dolphin Watch Cruises for a fun time spotting dolphins. Thereafter, you may also visit Hyams Beach. Next, visit the renowned Kiama Blowhole. You may go on Illawarra Fly Tree Top Walk before heading to Wollongong to sample local beers at Illawarra Brewery. Later continue with a drive to Mowbray Park Farm Stays to enjoy an Aussie farm stay experience. Consider making a stop at Glenbernie Orchard. Next, make Royal National Park your last stop before proceeding to Sydney.